So, even if it’s March, it’s time to go back to the beginning. As teachers, we know that a good mentor text can accomplish myriad miracles for our students. Ralph Fletcher notes that “if you really want to write in a powerful way, you’ve got to read powerful stuff and just feel the power of it, because nobody writes out of a vacuum.” So, we tirelessly search for just the right source to inspire our students, to illustrate our mini-lesson. We walk them through the highlights — helping them zoom in on what they need to see. But how do we teach them to do this for themselves? When they move into a different English class and aren’t given explicit mini-lessons, when their ninth grade writer’s notebooks have been lost, when they go to college and are entirely left to their own writing devices, when they go into the working world and need to produce a written product, mentor texts are the thing that will remain. So, how can I help my students move toward independence now — the kind of independence that will not only prompt them to use the mentor texts I hand them, but will enable them, empower them to do this on their own? what might be useful in this mentor text? how is this mentor text similar to or different from mentor texts you have been given this year? Many students brought in the first item that popped up in Google. The students discussed that many of these texts didn’t seem “professional” or “polished”. They were “bland” or “one-note” and didn’t have a lot to offer in terms of craft. We discarded these texts. With this experience under their belts — having thought about mentor texts through a different lens — we brainstormed common writing struggles we encounter and how mentor texts can help us wade through them. 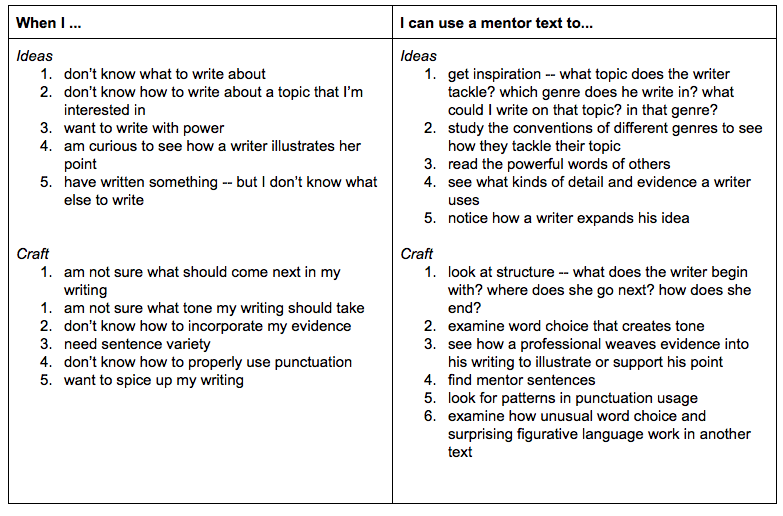 How do you engage your students with mentor texts? What mentor texts get your students excited? How do you teach them to do heavy lifting of mentor text study on their own? 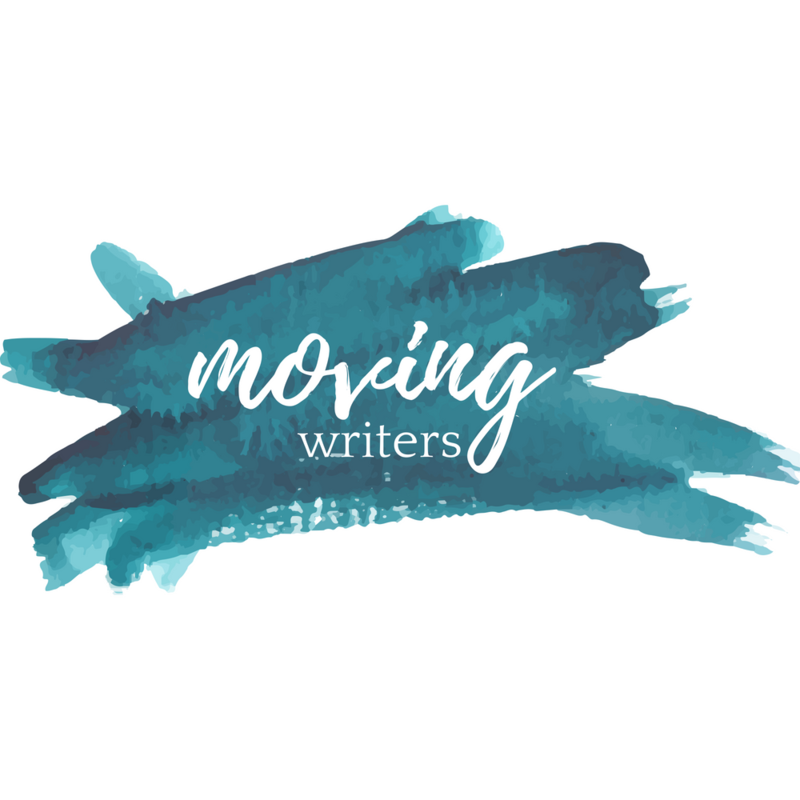 Join us Thursday, March 13 at 7:30pm EST for a #movingwriters chat to talk about using mentor texts & teaching students to use them on their own! Related: Have you read Mike Schmoker’s “Focus” (2011)? He emphasizes the value of reading, thinking, discussing, and writing around authentic texts. Your mentor text approach seems to fit in with his ideas. An excellent book that I think is a must-read for ELA teachers. Thanks for the recommendation! I’ll add it to my wish list! Thanks for reading!